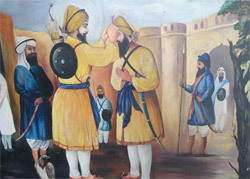 Baba Sangat Singh remained in the company of Guru Gobind Singh during peace and war. When Guru Gobind Singh left Sri Anandpur Sahib and reached Chamkaur after crossing the Sirsa stream, he was accompanied by a few Sikh warriors. Even at that critical movement, Baba Sangat Singh was in the service of Guru Gobind Singh. According to the Gurmata of Khalsa, when Guru Gobind Singh Ji decided to leave the Garhi of Chamkaur, keeping in view war strategy and some divine considrations, He made Sangat Singh done his dress and and sacred Kalgi (plume). 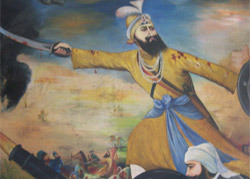 Baba Sangat Singh fell martyr while facing the enemy forces. But it was a matter of regret that Sangat Singh got no proper place in the history which he deserved most. Perhaps one reason of negligence is the fact that he belong to a humble and backward community. Baba Sangat Singh got martyred down at Chamakur but his cremation place ( Samadhi ) is situated in his native village Katta (Sabbour) in tehsil Noorpur Bedi in Ropar District near Anandpur Sahib. The people of area revere and worship and Samadh.